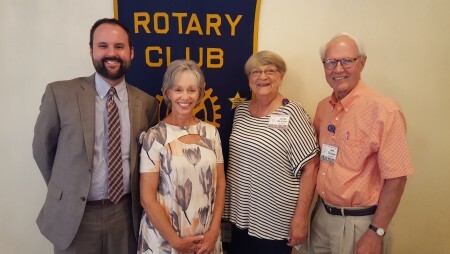 On July 12, the Auburn Rotary Club hosted representatives from the Village Friends Village Values organization, who spoke to Rotarians about its subscriber-based assistance to individuals 60 years of age and older. The organization provides subscribers a support system that helps these seniors remain as independent and living in their own homes for as long as possible through services that include transportation for errands and medical appointments, referrals for professional services, and various social and networking opportunities. Pictured with Club President Chris Warren (far left) and representing the organization are (left to right) Martha Shepherd, Judy MaGaha and Jim Disque. The Auburn Rotary Club meets weekly each Wednesday at noon at the Saugahatchee Country Club. For more information the club or becoming a Rotarian, visit www.auburnrotaryclub.com.